Was Ted Cruz the Favorite in the Republican Primary Among Church Going Evangelicals? Religion and politics Twitter is a weird thing. Someone posts an article that makes some type of bold assertion (usually about evangelicals), and then one us has to figure out if the data actually backs up that claim. An article from the American Conservative, written by Timothy Carney is the newest example of this phenomenon. The title neatly describes the thesis, “Why Ex-Churchgoers Flocked to Trump.” Carney goes on to make the argument that it was really the non-religious conservatives who were Trump’s strongest supporters, not the die-hard, church going evangelicals. Now, initially I misread this analysis in two ways. First, I assumed that the discussion was centered around the general election results. I have written before that Trump did the best with white, born-again Protestants who attended church frequently, so I knew that this analysis was incorrect. I even went back to check and expand my work. The chart belows shows white evangelicals’ vote choice in the last three general elections broken down by church attendance. Clearly, there is a strong positive relationship between church attendance and Republican vote share. It’s striking that the most frequent attenders were stronger for Trump than they were for Romney. Clearly there was no hesitancy among white evangelicals to cast a ballot for the 2016 Republican candidate. The other way I misread the article was that I thought the sample in question was evangelical voters. In reality, Carney had restricted his query to merely those who identified as Republican. That means his numbers included Catholics, Atheists, and Nothing in Particulars, or anyone else that identified as Republican. I don’t think that’s the best way to understand this question, because it is using a political filter then a religious categorization. Why even include religious “nones” in this category when it is clearly going to obfuscate the sample at the low end of the attendance spectrum and overemphasize religiously devout evangelicals and Catholics at the high end? So, what does the data say? Turning to the Voter Study Group and restricting the sample to just white evangelicals, I broke the Republican primary vote choice down by church attendance. 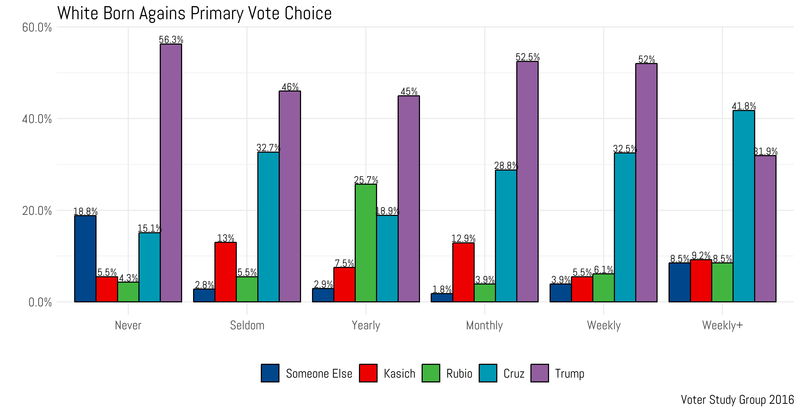 First, Ted Cruz did win a greater portion of the “more than once a week” vote share than Donald Trump did. In fact, Cruz got nearly half of this group’s primary votes. However, Trump won every other attendance category including those who attend weekly and monthly. I have a hard time using this evidence to support the theory that the faithful really liked Cruz. Yes, Cruz did well with the very active but that group was just 20% of the entire sample, while those who attended weekly made up 27.5% of the sample. I also looked at this same analysis using self-identified born agains as the variable to filter on and there was no real difference in outcomes — Cruz won the weekly+ category, but Trump was the victor in the other five attendance levels. A graph of that can be found here. But maybe this is the wrong way to look at things. Maybe if I looked at just the white evangelicals who are socially conservative, there would be a different result. The graph above does just that. It examines/analyzes white evangelicals who say that abortion should be illegal in all circumstances. Among this subgroup of pro-life white evangelicals it’s clear that Cruz is the favorite at most levels of attendance. In fact, Trump wins just two of the six categories, while Cruz doubles Trump’s support with the most frequent church attenders. This provides some support for the assertion that social conservative evangelicals were for Cruz. That made me think about how to breakdown evangelical voters into different political categories. Were evangelicals who voted for Trump different than those who voted for Cruz or even John Kasich? Luckily the Voter Study Group asked about the importance of 24 different issues in the 2016 wave, which was conducted during the presidential primary season. In the graph below, I broke down the evangelical sample based on what Republican candidate they voted for in the primary. The dot represents the group’s mean issue importance with the capped lines representing 95% confidence intervals. A clear impression from this data is that Kasich voters were more moderate than Cruz/Trump voters. This is especially evident on issues like racial/gender equality, the environment, and gay rights. However, were white evangelicals who voted for Cruz more conservative than those who chose Trump? I think that the answer is a tentative yes. There are many issue areas where the differences between the two groups is relatively small. On the top seven issues on the graph, there is no statistical difference. However, there are some areas where a gap opens up. Most notably, Cruz voters were less concerned with gay rights and the environment/climate change. Interestingly, the difference on abortion was relatively small and there was no statistical difference between the two on the importance of immigration issues. How about church attendance? Are the most frequently attending evangelicals politically different than those who are evangelical but never attend? The graph provides little support for the idea that church attendance drives a huge wedge between evangelicals. On almost every issue the gap between the groups is small or nonexistent. There are a few exceptions, however. For instance, those who attend the least seem less concerned with religious liberty than those who attend the most. However on the bottom three issues, the results are reversed: the never attenders care more about gender equality, climate change, and gay rights than those who attend weekly or more. In every case where the issue is more about fiscal issues (the size of government, the national debt, etc.) the differences across the attendance spectrum are very small or nonexistent. The true test however, is if white evangelicals who voted for Cruz, Rubio, or Kasich in the primary chose to not vote for Trump in the general election. The above graph displays the results of that: 99% of Trump voters in the primary voted for him in the general. Of those who chose Ted Cruz in the primary, nine out of ten voted for Trump in the general election, while the rest voted for the libertarian Gary Johnson. The vote switching for Kasich and Rubio supporters was more pronounced, though. Over half of the white evangelicals who voted for Kasich then turned around and voted for Hillary Clinton in the general election, while the same was true for a quarter of Rubio supporters. Keep in mind that only 15% of white evangelicals voted for Rubio or Kasich in the Republican primary, however. Let’s look at this one more way. The chart below visualizes how votes in the primary translated to votes in the general election for white evangelicals. ¾ of Trump’s support came from his and Cruz’s primary voters, while 80% of Clinton’s support came for her supporters and Bernie Sanders primary voters. It’s interesting to note that almost no Cruz supporters voted for Clinton in the general. In total, 15% of Clinton’s votes in the general came from white evangelicals who cast ballots for Republicans in the primary. If anything, I think I can make more sense of why white evangelicals so easily shifted their support from Ted Cruz to Donald Trump when it was clear that he was going to be the GOP nominee. It’s for two reasons: many of them supported Trump in the first place. As described above: Cruz only did well with a small portion of white evangelical voters. The other reason is that the jump that many of them had to make from Cruz to Trump was relatively small. Most of the Cruz supporters were statistically the same as Trump supporters on a wide variety of issues, especially fiscal questions. The upshot is this: white evangelicals are fairly monolithic. Sure, some are more socially conservative than others but by and large they are shockingly similar. The idea that there was a strong and significant bloc of socially conservative evangelical Cruz voters who had to drastically change their mind to vote for Trump is not supported by the data that I analyzed. Ryan P. Burge teaches at Eastern Illinois University in Charleston, Illinois. He can be contacted via Twitter or his personal website. The syntax for the post can be found in this gist.